Academic Integrity (AI) is taken very seriously and it is your responsibility as a student to know, understand, and follow the University of Waterloo policies. Violations can have serious consequences, affecting your grades, academic standing, and future career. Ignorance is not an excuse. Check out the following: Fact Sheet for Undergraduate Students (PDF) , AI brochure (PDF), and complete the Undergraduate AI tutorial to be sure you have all the knowledge you need. Help with citation styles is also available on the Library website. You are responsible for reporting instances of academic dishonesty that you may witness. Every member of the University of Waterloo community must demonstrate their commitment to honesty, trust, and fairness by ensuring they do all they can to create a level playing field. If you are aware of misconduct, talk to your professor, academic advisor, or the Office of Academic Integrity about the situation. Take advantage of the information and resources available on campus and online. Policies. Becoming familiar with the University of Waterloo’s policies will help you understand how the university deals with misconduct. Academic integrity fact sheet. Read this Student Fact Sheet (PDF) for more information on misunderstood offences and other important facts. Academic integrity tutorials and videos. 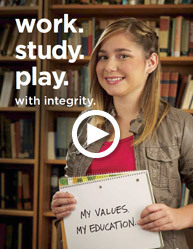 The University of Waterloo has many tutorials and videos that discuss academic integrity. You can also access another tutorial from the Office of Research Integrity at the U.S. Department of Health and Human Services. Academic assistance. Get help in strengthening your academic writing skills and learn where you can go for academic advising. Correct formatting and referencing. Ensure your assignments are properly formatted and include proper citations for your sources. Failure to properly acknowledge your sources will result in an academic penalty. Time and stress management. Take advantage of counseling and academic advising services to help you deal effectively with stress. Faculty contacts. Find out who handles academic integrity issues in your Faculty. The University of Waterloo is committed to helping students achieve their academic potential. Take responsibility for your actions and be proactive - we are here to help! Integrity works at Waterloo. In the past we have trained graduate and senior undergraduate student volunteers to represent the Office of Academic Integrity at promotional events and engage other students in a variety of fun, educational activities. More recently, we have collaborated with the Library to have their Library Ambassadors run our events and promote AI to students. For more information about the Library Ambassador program contact: mlbartlett@uwaterloo.ca for details. Liaison Librarian, Tim Ireland, presents this hands on session that reinforces the importance of citing properly in assignments and introduces RefWorks - a powerful software that automatically generates in-text citations and bibliographies in any style. This session is ideal for students, but faculty and staff are also welcome! For more information and to sign up for a session, visit the Library's RefWorks subject guide. Integrity is important to everyone at the University of Waterloo. See why uWaterloo's President, faculty, and staff work, study, and play with integrity every day. President Feridun Hamdullahpur knows that a university education is about learning, discovering, and achieving your goals with honesty. Nothing is better than succeeding thanks to your own hard work. Integrity is everywhere at Waterloo. Pearl Sullivan, Dean of Engineering, knows that your research methods are just as important as your results. Properly crediting your sources is a crucial part of any degree. Queenie knows that your decisions affect the rest of the university community, so it is important that you always act with integrity. Being honest and working hard are the keys to your success. Lilli knows that working and living on campus isn't all fun and games. To successfully balance your academic work with your social life, you must act with integrity. It's not easy, but it is rewarding. There are many integrity stories at Waterloo worth listening to. 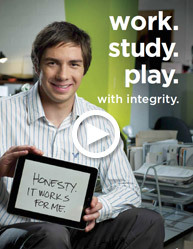 See how Melody, Scott, Vanessa and Mark work, study and play with integrity every day. Melody knows the best soccer players don't bend the rules, they bend the ball. Because success isn't just about winning the game, it's about winning respect. At Waterloo, we play by the book. Scott's co-op terms give him the inside edge on what it takes to be successful. Like being truthful during job interviews, and staying off Facebook during office hours. At Waterloo, integrity works. Vanessa knows a top education isn't just about high grades, it's about earning them. At Waterloo we study hard, get support, and ask professors for guidance. Make your mark here, honestly. Mark not only treats his roommate with respect, he respects himself too. That means getting enough sleep, eating right, and knowing the choices he makes tonight will have an impact on tomorrow. Integrity lives at Waterloo. The Writing and Communication Centre—Offers a number of workshops designed to assist students with their writing skills. Academic advisors—Advisors can assist you in planning your academic career at the University of Waterloo. Professors—Your course professor can clarify any integrity-related questions you may have. The Library has extensive resources to help you with your citations. The American Psychological Association (APA) and Modern Language Association (MLA) formats are most commonly used, but the exact format used may vary depending on your program and courses. Academic integrity involves correctly crediting your sources as this alerts your instructor to the fact that you are not the author or creator of the ideas in your assignment and provides a path for your instructor to follow up on your work. The following books are helpful if you want help with your grammar, writing and editing skills, or source reference formatting (for your works cited page or bibliography). Both are available at the University of Waterloo Bookstore. You get out of your education what you put into it - if you cheat, you are really cheating yourself. You need to know the information: for the exam; for the next course you take; for admission to graduate school... taking shortcuts will not help you in the long run. If you want to work on improving your writing skills, research techniques, study habits, or exam preparation skills, check out Counselling Services and the library for workshops and tips you can try. Need to talk? Your academic advisor is only a phone call or email away. I've been charged with an academic offence. What do I do? If you are charged with an act of academic dishonesty, it is important to tell the truth. If there are what you feel to be extenuating circumstances, put them forward at each step in the process. Above all, learn from your mistakes, and take corrective action for the future. You may want to discuss the allegation(s) with your professor and/or academic advisor to ensure a thorough understanding of how they believe you may have violated the University of Waterloo policy. Even if the situation is resolved informally, your professor is required to report all violations to the Associate Dean for your Faculty. Read the University of Waterloo policy 70 (Student petitions and grievances), policy 71 (Student discipline), and policy 72 (Student appeals), they will provide you with information regarding the procedures that will take place. Uploading course materials, including lectures, quizzes, and exams, onto online sharing platforms is considered to be a copyright violation, regardless of whether an individual did so intentionally or unintentionally. Students may not distribute or reproduce the materials, whether for commercial purposes or not, without the express written consent of the faculty or instructor. The University of Waterloo recognizes that its graduate students come from a variety of cultural and educational backgrounds, and that expectations about academic integrity can differ from one institution to another. To satisfy this need for consistency across graduate programs and to inform and support our graduate students, uWaterloo has created the Graduate Academic Integrity Module (Graduate AIM). The Graduate AIM is an online course that all new graduate students are required to take through Waterloo LEARN. 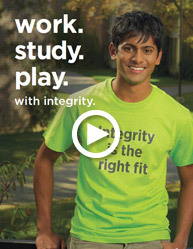 Students must read the information about academic integrity and then receive a mark of at least 75% on an online quiz. The quiz must be successfully completed within the first 8 weeks of the term. The Graduate AIM is not visible in LEARN until the first day of classes each term. University policies on academic offences, intellectual property, student discipline, etc. The goal of the Graduate AIM is to ensure that all graduate students are given the resources and information to work, study, and play with integrity. *Please note: the Graduate Academic Integrity Module does not replace or substitute your participation in academic integrity milestones that are required in the Faculties of AHS, ARTS and SCI. Students in AHS, ARTS and SCI must complete both requirements. For text and video instructions on how to access the Graduate AIM, please visit How to access the Graduate AIM. For more information, please visit the Graduate AIM Frequently Asked Questions. What is the Graduate AIM? How do I access the Graduate AIM? Why am I enrolled in the Graduate AIM? Why can't I see the Graduate AIM in LEARN? What content does the Graduate AIM cover? Does my score in the Graduate AIM affect my GPA? Why do I have to complete the Graduate AIM? How do I complete the Graduate AIM? How long does the Graduate AIM take to complete? I didn't get a 75% on the Graduate AIM quiz. Can I retake it? Is there a due date for the Graduate AIM? What happens if I do not complete the Graduate AIM? I don't see the Graduate AIM on LEARN - what does that mean? Q: What is the Graduate AIM? A: The Graduate AIM stands for Graduate Academic Integrity Module. It is a mandatory course for incoming graduate students, designed to be a simple but comprehensive introduction to academic integrity. It also provides information and resources for you to use as a student and as an important member of the university community. The Graduate AIM has two components: a tutorial and a quiz. To successfully complete the Graduate AIM, a student has to read the tutorial material and then score at least 75% on the quiz. The Graduate AIM was approved by the Associate Deans, Graduate Studies, Deans' Council, and Senate Graduate and Research Council. Q: How do I access the Graduate AIM? A: Visit the "How to access the Graduate AIM" page on this website. If you are experiencing LEARN access issues, please visit the LEARN Help website. Q: Why am I enrolled in the Graduate AIM? A: All incoming graduate students are required to complete the Graduate AIM. This ensures that everyone has the same access to information about academic integrity, and understands what it means to act with integrity. Q: Why can't I see the Graduate AIM in LEARN? A: The Graduate AIM is not visible in LEARN until the first day os classes each term. Q: What content does the Graduate AIM cover? A: The Graduate AIM reviews university policies about academic integrity, common violations of academic integrity, and resources to help you act with integrity at uWaterloo. The quiz portion of the Grad AIM applies that basic information to scenarios relevant to our graduate students. Q: Does my score in the Graduate AIM affect my Grade Point Average (GPA)? A: No, the Graduate AIM does not affect your GPA. When you successfully complete the Graduate AIM by scoring at least 75% on the quiz portion of the module, it will appear on your transcript on Quest as “Completed” and graded as “CR” (Credit Granted). Q: Why do I have to complete the Graduate AIM? A: Academic integrity is more important than ever to the University of Waterloo. We want to give you resources to help you recognize and avoid academic offences. The Graduate AIM has very important information that will help you succeed during your graduate studies. Q: How do I complete the Graduate AIM? A: To complete the Graduate AIM, you must read the tutorial material and then receive at least a 75% on the quiz. For instructions on how to find the Graduate AIM in LEARN, visit "How do I access the Graduate AIM?" Q: How long does the Graduate AIM take to complete? A: The Graduate AIM should only take you one hour to two hours to complete, depending on your pace. This time includes an in-depth reading of the material, and careful consideration of the quiz questions. Q: I didn't get a 75% on the Graduate AIM quiz. Can I retake it? A: You have five tries to get at least a 75% on the Graduate AIM quiz. If you did not get a 75% on the first attempt, we strongly recommend that you reread the tutorial material before retaking the quiz. If you are not successful after five attempts, the Office of Academic Integrity will contact you to discuss what happened. You will then be re-enrolled in the Graduate AIM and given an additional five attempts. Q: Is there a due date for the Graduate AIM? A: You must successfully complete the Graduate AIM by 8 weeks into the term. The exact date will be provided to you and is dependent on your start date in your program (e.g., Winter, Fall or Spring start). Q: What happens if I do not complete the Graduate AIM before the due date? A: The Graduate AIM should take one to two hours to complete, so it is easy to set aside time for it. If you do not complete the Graduate AIM a "Hold" will appear in your Quest account and prevent you from registering for future courses. After the deadline, you will no longer be able to access the Graduate AIM quiz. The Office of Academic Integrity will contact you in regards to completing the quiz. Remember, you must successfully complete the Graduate AIM quiz to enrol in future courses! Q: I’m a new graduate student, but when I log into LEARN I don’t see the Graduate AIM. What does that mean? A: The Graduate AIM was implemented in September 2013 and is now a required course for all new graduate students. Access to the course is only available to students who have paid tuition or are "Fees Arranged" in Quest. If you have not paid tuition or become "Fees Arranged," the Graduate AIM will not appear in LEARN. Note: The Graduate AIM course is not visible to students, despite being fees arranged, until the first day of classes. If you have paid tuition or become "Fees Arranged", but you still do not see a link to the Graduate AIM in LEARN, please wait a few days for the system to recognize your arrangement. If you have waited but still do not see the Graduate AIM, it is an administrative error. Please contact the course administrator, Amanda McKenzie, to have this error corrected. Remember: the Graduate AIM is a mandatory degree requirement. Still have questions? Please contact the course administrator, Amanda McKenzie, by email (academic.integrity@uwaterloo.ca) or at 519-888-4567 ext. 38562. NOTE: The Graduate AIM is not visible in LEARN until the first day of classes each term. This video will explain how to access the Graduate Academic Integrity Module (Graduate AIM) through the Waterloo LEARN system.